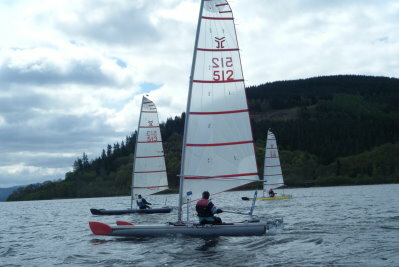 The series got off on Saturday afternoon in great racing conditions, a fresh NNW breeze and patchy sunshine. The breeze was fresh enough for Gareth to trapeze regularly but others experimenting gained nothing, and lulls and shifts remained challenging to everyone. 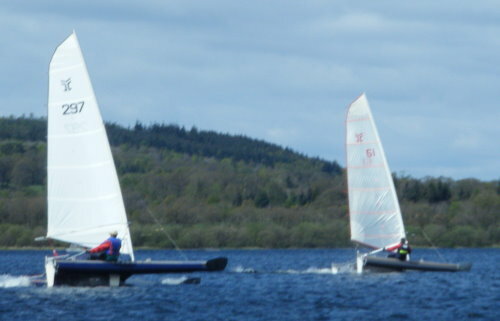 In Race 1, good starts let Alastair Forrest lead Cliff Antill and Paul Ellis narrowly around the first windward mark. Meanwhile, Nigel Harrison's Dyneema forestay parted on the start line and the rig went over. Gareth pulled up as the long lap went on, catching Paul, and Stuart Ede closed up behind in third, these three moving away as a front pack, holding these places to the finish. George Evans put in a storming second lap to move from the back group to take over and hold fourth. Alastair just behind Cliff and Justin Evans saw Nigel (returning re-rigged) idling round the Committee boat, and concluded that the second long lap was the last, stopping for a rest until his brain switched back on, and the others stretched away. A broken boom removed Stuart before the start, and Nigel and Alastair led away. Cliff pulled through to lead after the long first lap, and Paul and George came through the fleet. In the second lap, Gareth Ede came up from a slow start to form a battling group of three out in front with Paul and George, while Dave Jennings built up from the rear group. The downwind starboard rounding at the end of each lap claimed victims at the back of the fleet, as in the mixed fleet any boat chased round the mark was trapped, unable to tack onto port with a starboard boat on its shoulder, and a stall was disastrous. In the final lap, dramas cost places. Paul, chasing Gareth downwind thought he was defending with aggressive luffing until realising that Gareth had misremembered the complex course. George hard on them took his opportunity to come through to first, and Gareth retired. This let Nigel�s good hold on fourth upgrade to third. Further back, Cliff just ahead of Alastair on the final short beat risked throwing onto port, and they collided to let Dave Jennings grab fourth. Sunday dawned cold and windy with black gusts across the lake even when the sun broke through. By the time the fleet was out, it had dropped back, with only Gareth consistently trapezing, and the gusts manageable if watched. The Race 3 start had a big late port bias, well picked by Stuart and Nigel, the rest struggling to cross the line, with Cliff recovering. Nigel held the lead after lap one, with Gareth pulling up. In lap two, Paul and George continued their climb from the start chaos, and in the battle for the front Nigel couldn�t hold the consistency needed, falling back to the middle. The downwind starboard rounding claimed more victims in the tight mid-fleet competition. Justin, rounding seventh, swept round and stalled, and Alastair following round stalled on him, leaving a wide floundering obstruction for the indignant pack rounding behind. Their elaborate 360� amidst the fleet running down took them to the back. The finish dramatically showed the quality of the racing, with Paul leading in the tight front group of four, crossing a few seconds apart (photo below). Anthony Costall, improving with each race, followed Nigel in for sixth. The swinging wind gave Race 4 another late port bias to the start, and Nigel, Alastair and Stuart used it well, but fate then cruelly punished them on the right of the beat by another big shift. Paul, George, Stuart and Gareth fight up to the Committee boat to finish for first place, only seconds apart, and Nigel arrives downwind. 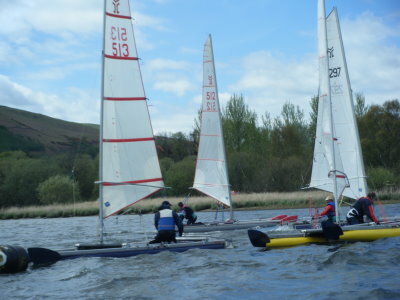 For Race 5, with sunshine and a falling breeze, the course was shifted to include reaches, keeping its complexity and the downwind starboard mark. A front group of Paul, Gareth and Stuart again pulled ahead (with Paul already assured of the title) but with other series leaders George and Cliff back in the big group closely competing back and forth. In the second of the two long laps, some fast reaches pulled Alastair up out of the pack. Gareth just beat Paul for first, and in the final reach, Alastair was onto Stuart, who managed to pinch up straight to the line to avoid the port tack trap. Monday morning for Race 6 brought bright sunshine over the lake with catspaws of shifting breeze. A start delayed by half an hour allowed settling into a light n.n.westerly, shifting through 30 degrees at times and leaving holes at crucial marks. Cliff Antill got away well from a tangled drifting start, and to cut a very long race story short, moved out into a lead he held at every mark to the finish, an impressive demonstration of sailing your own boat rather than watching other people�s races, and staying in a comfort zone. He was gained on as the wind died away or shifted, but then could stretch away again to keep some space in hand. The boats following him after the first short beat in the fluky conditions had the monohull fleet leaders catch them, with a series of pile-ups at the downwind mark. Paul and then Alastair got around inside ff�s grinding together, but the next tangle of boats engulfed both fleets, and the cry of �Water, water at the mark� was answered by the cry �There ain�t no water here�.